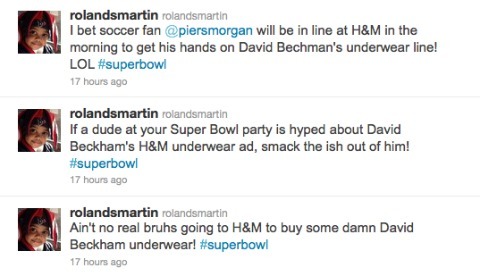 Martin, who spent Sunday evening live-Tweeting the game and several commercials, made a remark about an H&M commercial for David Beckham‘s line of men’s underwear. The ad, for those who missed it, features close-ups of the soccer player clad only in a pair of briefs. 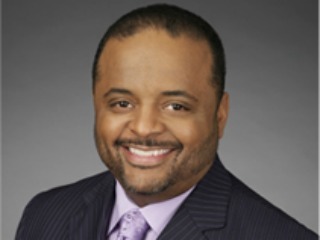 Fam, let me address the issue that some in the LGBT community have raised regarding some of my Super Bowl tweets yesterday. I made several cracks about soccer as I do all the time. I was not referring to sexuality directly or indirectly regarding the David Beckham ad, and I’m sorry folks took it otherwise. It was meant to be a deliberately over the top and sarcastic crack about soccer; I do not advocate violence of any kind against anyone gay, or not. As anyone who follows me on Twitter knows, anytime soccer comes up during football season it’s another chance for me to take a playful shot at soccer, nothing more. At this time, the duration of Martin’s suspension is unknown. Additional reporting by Alex Alvarez.